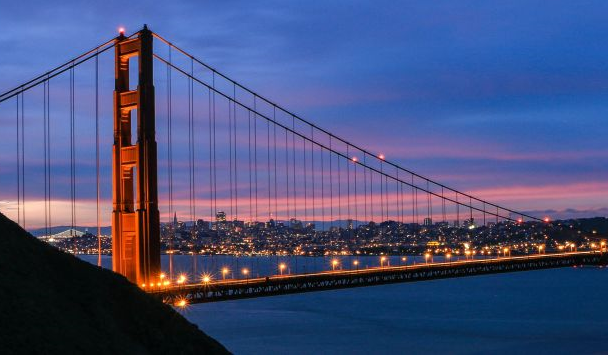 One of the nicest things about visiting San Francisco is that, although the city is “big” in terms of attractions and amenities, it is geographically small – only 49 square miles. Consequently, it is very easy to see and do a great many things in a short period of time. The Golden Gate Bridge , the most famous bridge in the world, manages to impress even the most experienced travelers with its stunning 1.7-mile span. Approximately 120,000 automobiles drive across it every day. A pedestrian walkway also allows the crossing on foot, and bikes are allowed on the western side. The Golden Gate Bridge is said to be one of the most photographed things on Earth. Cable cars have been transporting people around San Francisco since the late 19th century. The cars run on tracks and are moved by an underground cable on three routes. Their familiar bells can be heard ringing from blocks away. Tickets ($7) may be purchased at the cable car turnarounds at the ends of each route. Each one-way ride will provide spectacular views of the city’s celebrated hills as well as exhilarating transportation. Fisherman’s Wharf is also home to PIER 39, a festive waterfront marketplace that is one of the city’s most popular attractions. A community of California sea lions has taken up residence on the floats to the west of the pier and visitors line the nearby railing to watch their antics. From there it’s a short walk to the San Francisco Dungeon , Madame Tussauds , Ripley’s Believe It or Not! and the famous crab vendors selling walk-away crab and shrimp cocktails. Union Square is the place for serious shoppers. Major department stores and the most exclusive designer boutiques line streets like Post, Sutter, Geary, Grant, Stockton and Powell. The Westfield San Francisco Shopping Centre houses the largest Bloomingdale's outside of New York and the second largest Nordstrom in the U.S.
North Beach , the city’s Italian quarter, isn’t a beach at all. It’s a neighborhood of romantic European-style sidewalk cafes, restaurants and shops centered near Washington Square along Columbus and Grant avenues. The beautiful Church of Saints Peter and Paul is a beloved landmark. Coit Tower atop Telegraph Hill offers a splendid vantage point for photos of the bridges and the Bay. Inside the tower, floor-to-ceiling murals painted in the 1930's depict scenes of early San Francisco. The entrance to Chinatown at Grant Avenue and Bush Street is called the "Dragon's Gate." Inside are 24 blocks of hustle and bustle, most of it taking place along Grant Avenue, the oldest street in San Francisco. This city within a city is best explored on foot ; exotic shops, renowned restaurants, food markets, temples and small museums comprise its boundaries. Visitors can buy ancient potions from herb shops, relax and enjoy a "dim sum" lunch or witness the making of fortune cookies. Dining in San Francisco is an attraction in itself. Known as one of America’s best restaurant cities , San Francisco chefs excel at combining the freshest local ingredients, authentic international flavors and a touch of creative genius. Choose your cuisine – Chinese , Japanese , French, Italian, Spanish, Moroccan, Indian, Malaysian, Mexican , Greek, Russian or “fusion,” a combination of any or all of these influences. Visit our Dine section for a list of San Francisco's hottest restaurants and insider tips from local food and wine writers. Nightlife in San Francisco is a constantly changing scene. The “hottest” clubs currently are in the South of Market and Mission districts, with live and recorded rock and Latin music. Jazz, blues , swing and “oldies” music can be found all over town. For a complete list of nightlife options, visit our Nightlife section. A visit to San Francisco would not be complete without a cultural experience. The city is home to internationally recognized symphony, opera and ballet companies. Many playwrights introduce their works in San Francisco and avant-garde theatre and dance companies dot the city. The San Francisco Museum of Modern Art (closed until early 2016), the Asian Art Museum , the de Young Museum, the Legion of Honor and other museums and galleries are devoted to the finest of classical and contemporary arts. San Francisco is also home to the California Academy of Sciences - the only place on the planet with an aquarium, a planetarium, a natural history museum, and a four-story rainforest all under one roof. For a complete museum guide, visit our museums listings . Save on San Francisco Hotels with Booking.com!